Toronto-born mosaic artist, Chay Greenberg, creates one-of-a-kind mosaics for any setting. Her art has most recently been displayed at the Barrie 19th Annual Christmas Craft Show, as well as the Mariposa Folk Festival in Orillia, Toronto’s Artscape in the Distillery District and the well-known artisan locale, Wychwood Barns. Her first contact with mosaics occurred during her search for an artistic medium to express her inherent creativity. 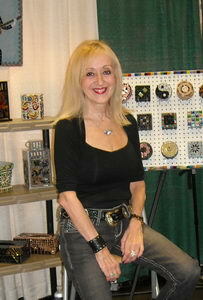 Her fascination with color, texture and surface of mosaic art has remained constant ever since. Chay’s mosaics are created using quality materials including colorful glass and stone, stunning handmade beads and ceramic tile. Virtually all pieces are cut by hand and many works take days to complete. The end result ranges from traditional to contemporary, all the way to charming and whimsical. Some of her pieces are developed through the ingenuity of her imagination while others are designed as commissioned works, crafted in collaboration with the buyer to meet specific needs and tastes. Says Chay,”I challenge myself to produce pieces that are decorative, functional, fun and funky. I especially love colour and sparkle, and it’s exciting to infuse these elements into every piece I design”. Please visit Chay’s gallery on this site to view a sample of her custom pieces.